We offer a welcoming, caring and dedicated environment for patients and their owners. 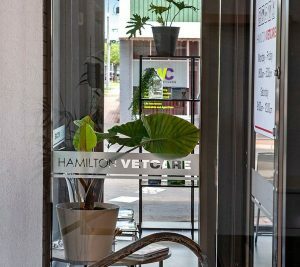 Hamilton Vetcare strives for best practice veterinary care, and has a new, fully equipped surgery and hospital, with multiparameter anesthetic monitoring, surgical electrocautery, veterinary dentistry unit, digital radiology and separate dog and cat wards & consulting rooms. Hamilton Vetcare aims to provide the best possible service to our clients and their animals. Doctors Scott, Lauren & Amy have a combined 30 years of veterinary experience. Since graduating, Doctors Scott and Lauren have practiced in Hamilton, Horsham, Melbourne and the United Kingdom and have completed numerous postgraduate courses & conferences to update and further their skills and knowledge. We have a great respect for naturopathic and homeopathic complementary medicine, and were initially surprised when Scott and Lauren were remarkably supportive of our wishes to use these alternative treatments where possible. As vets who practice and trust in conventional veterinary medicine, it is a huge credit to them both that they are not only willing to support alternative treatments, but have even assisted us by researching the most appropriate supplements. By observing the veterinary nurses’ attention to their patients, it is obvious that their job is in fact more of a “calling”. We are grateful for the genuine care they give our family; nothing is too much trouble.